Finally finished except for hanging chisels, screwdrivers, measuring devices, coping saws etc. in the doors. The tiger maple really shows itself, especially the door panels. 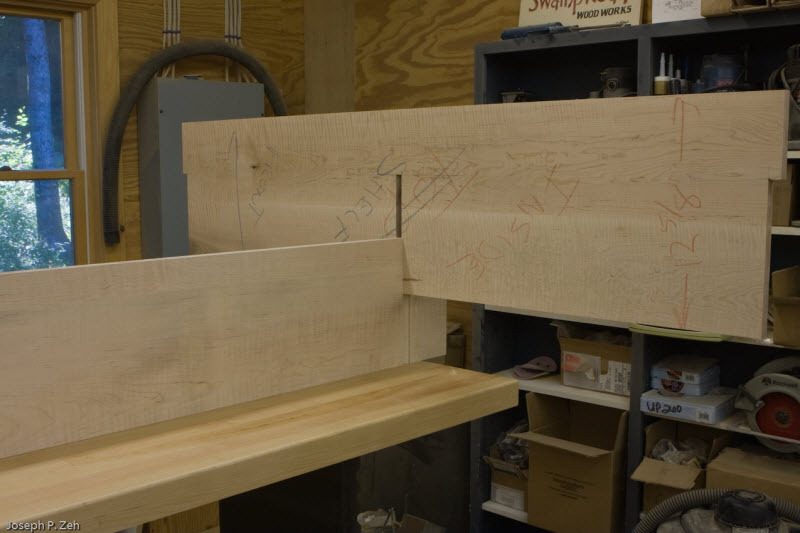 The panels were originally from one very wide board, but owing to the tangential curvature of the plain cut, the center of the board didn’t have much figure. It all appeared on the outside of the board. So I ripped the boards down the middle, turned the two pieces so that all the figure was in the middle and glued them back together. 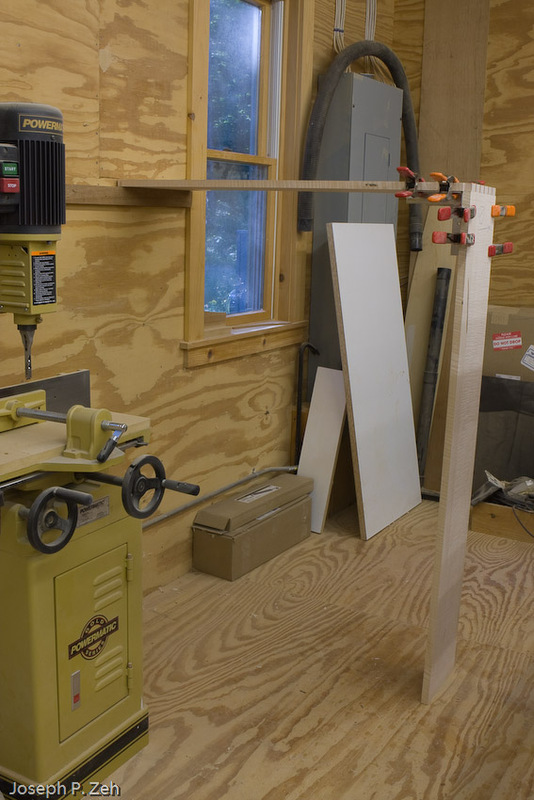 Then I used my band saw to re-saw the boards to achieve 1/4 inch thick panels. Finally, I cut the panels to width keeping the glue line in the center. The result is a highly figured panel that shimmers in the light. 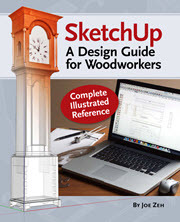 The is one significant change from the original SketchUp model. I made the drawers twice as wide reducing the number from four to two. This allows me to place things that are over one foot long in the drawers. In the picture at right you can see that I have yet to hang any tools in the doors. 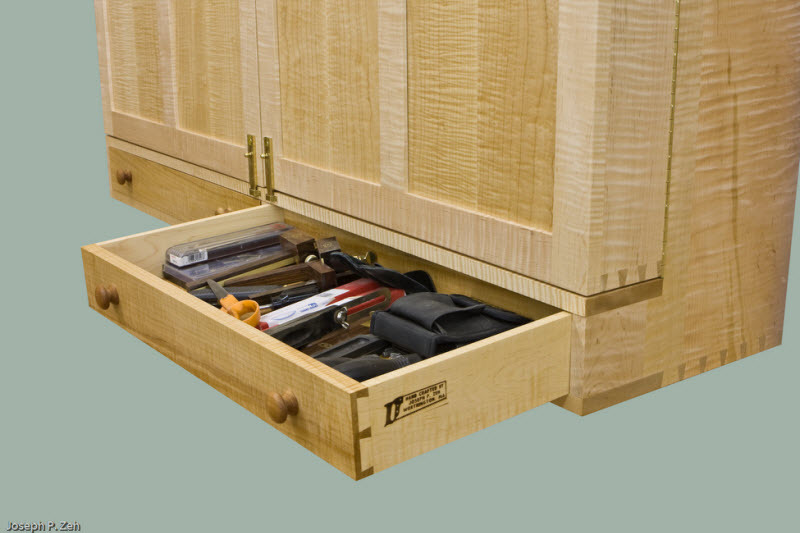 Placing tools is a very personal task and is best done over time as you understand how you will use the cabinet and the tools inside. It may take me six months or more to fully utilize the cabinet space. You can see that I have made room for planes I intend to buy in the future. 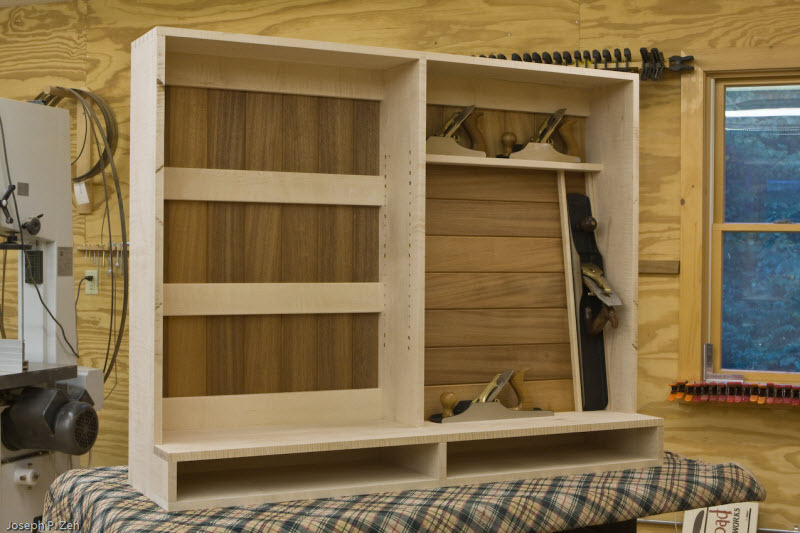 Also there are shelves for some consumable materials that are frequently used and need to be close by, such as pocket joinery wood screws. 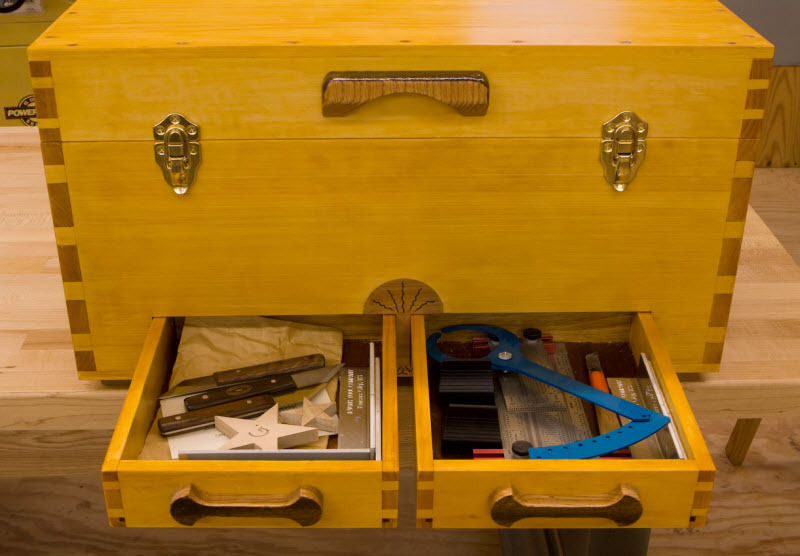 The drawers currently contain my measuring devices, marking gauges, marking knives etc. Much of these things will also end up in the doors. It is unclear what the final use of the drawers will be. 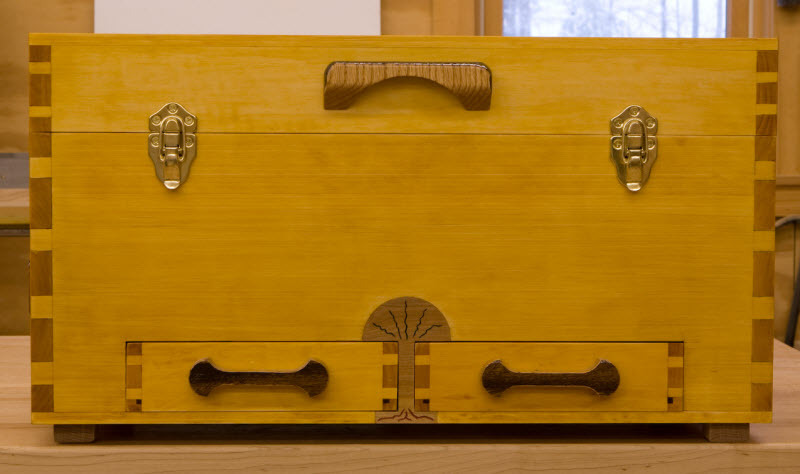 Originally the design had no drawers, but I was convinced by many woodworkers who had built their own chests to include a few. I generally find them a catch all, and hence difficult to organize. We will see. Believe it or not, I paid about $1 a bd ft for the material. I almost never pay more than $2 bd ft for any of my wood. I have cultivated local sources and even cut my own on occasion. See http://www.srww.com/blog/?p=28 for a better explanation. The project requires approximately 70 bd ft depending on your estimate of waste. I never keep track of my hours since this is a hobby and this project dragged on due to other family events and trips. 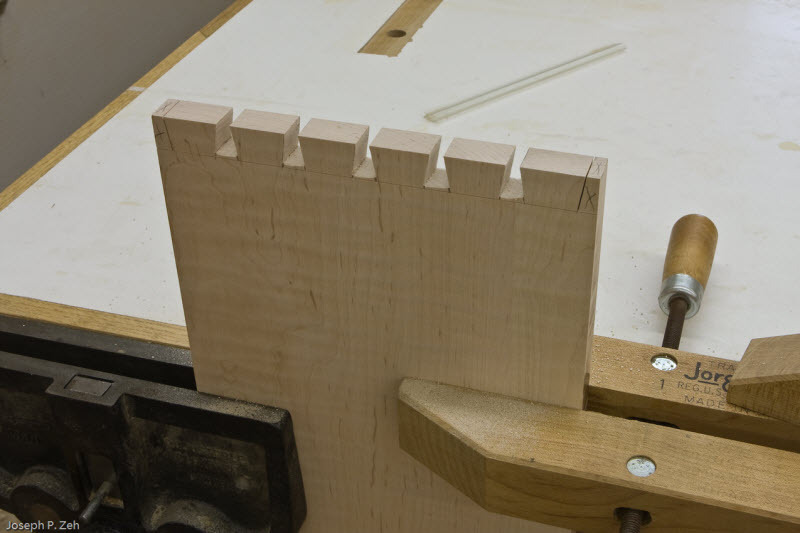 Also, there is a lot of hand dovetailing, hand planing and hand sanding in this project, which takes quite a while. If I were to estimate the time it spent it would be a pure guess. That said, maybe 60 hours. But that is 60 hours of pure joy! 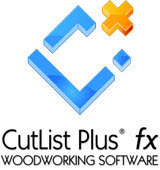 I may post one final update six plus months down the road when I have the cabinet full of woodworking toys. 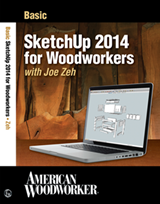 Til then, happy woodworking! 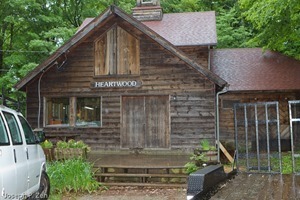 With summer nearly gone and our month long family reunion behind me, it is now time to get back in the shop. 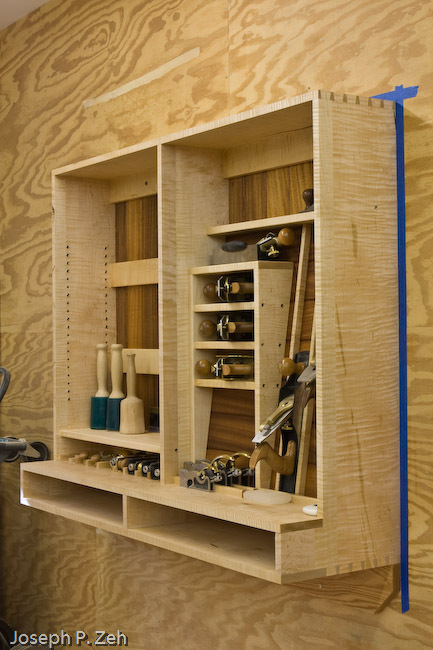 As I announced earlier, my current project is a Wall Hanging Hand Tool Cabinet to house my precious, well,…… hand tools. As always my projects begin by selecting the rough lumber I will use. Then I join, plane, edge, glue, thickness and finally cut them to rough shape. 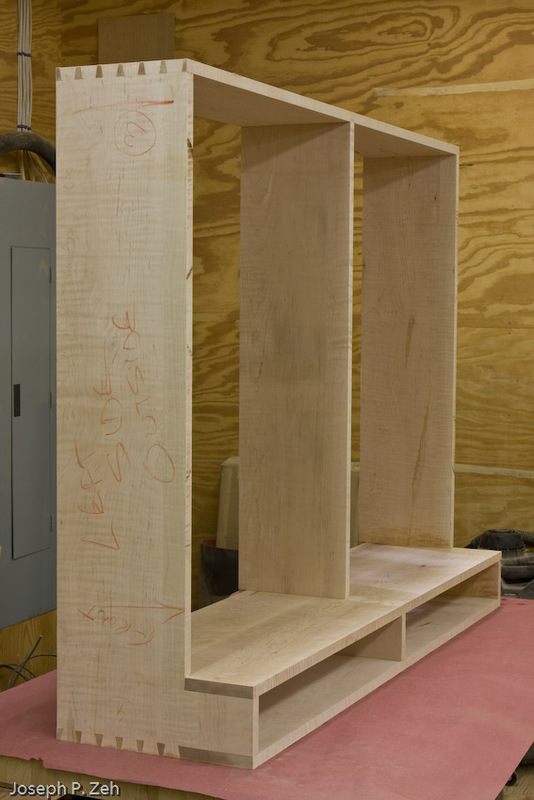 At left is a stack of rough cut panels that represent the top, bottom, sides, shelf and divider. Each panel is marked with carpenters crayon with its name, face and front edge designated. 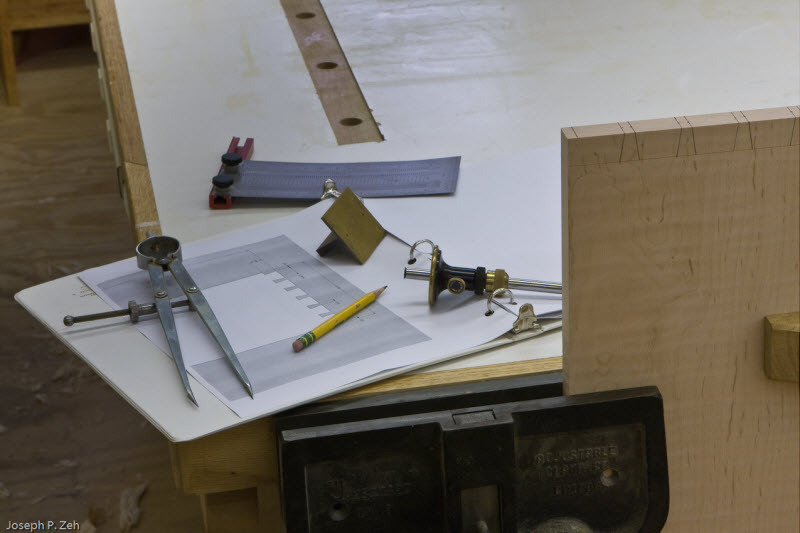 This helps keep track of the intended use of each panel, which is important for a number of reasons, not to mention that I choose the best grained and figured boards for the surfaces that will show. Oh! Did I mention that I am using tiger maple for this cabinet? The final thicknessing of the panels was done after they sat in my shop for a few days to let any final warp-age, bow, twist etc. settle out. 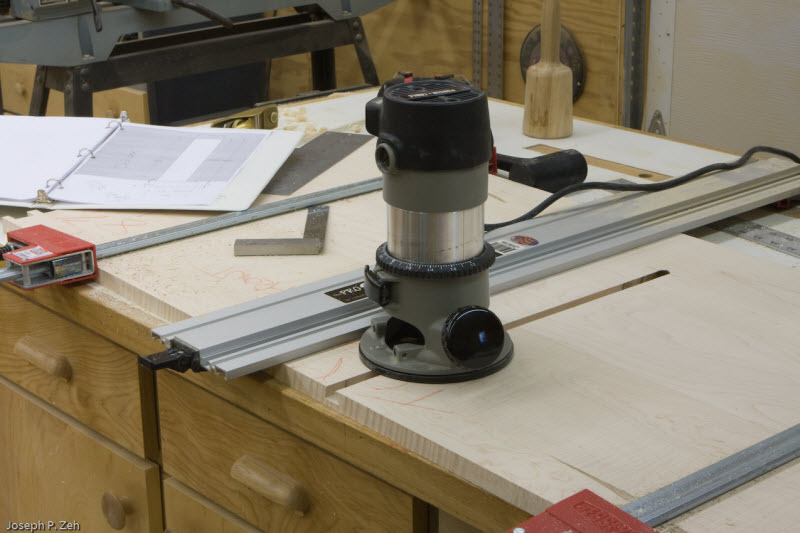 (Thicknessing is a verb found only in the Woodworker’s Dictionary. Don’t look for it in Webster’s.) After thicknessing I cut each panel to exact final dimensions including any cutouts. 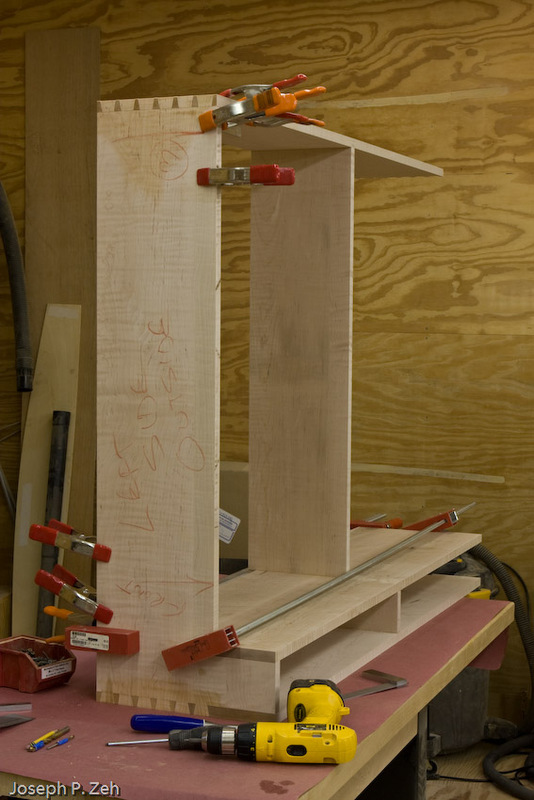 At that point I am ready to begin cutting the joints, starting with the dovetails. I am a “tails first” guy; I begin by marking up the tails on (in this case) the sides. 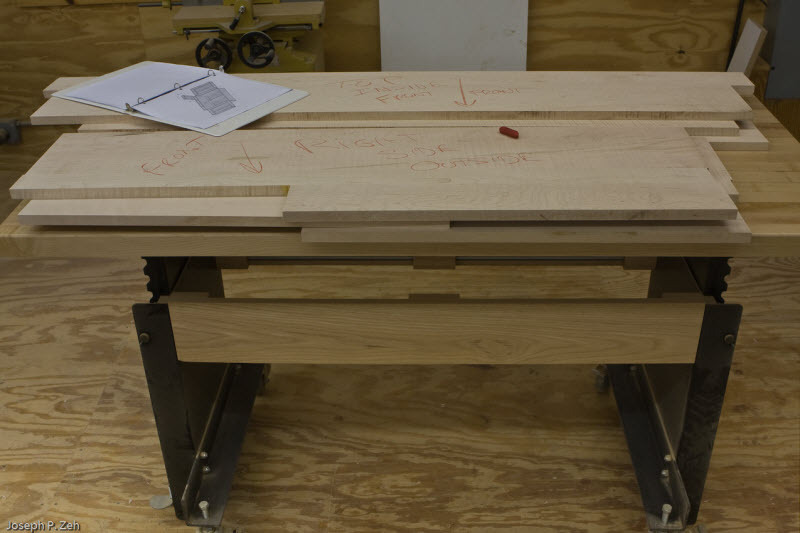 The picture at right shows the tails marked up and the tools I use to accomplish this: a pencil, divider, Veritas marking gauge, measuring device (accurate to 1/64″), Lie-Nielsen dovetail marker and yes, a shop drawing with dimensions. 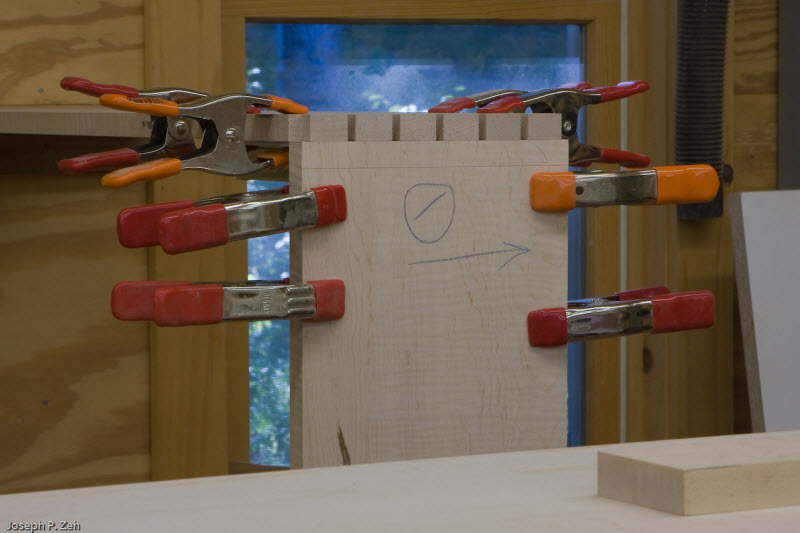 If you are Frank Klausz and have already cut a lifetime of dovetails, you don’t bother to markup your board. You just cut by eye. I hope one day to master that. But in the mean time I markup, and since I draw all my plans in SketchUp, why not print out dimensioned drawings to keep myself on the straight and narrow? Using a dovetail saw I make the vertical tail cuts followed by cleaning out the waste with a fret saw as shown in the picture at left. 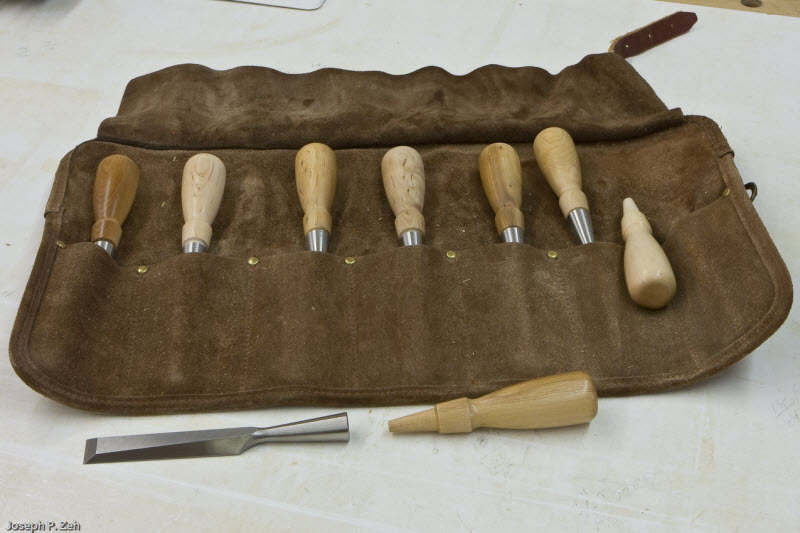 Note that when removing the waste in the area that will eventually be occupied by the pins I am careful to leave enough material to protect the scribe lines I will use to guide my chisel, which will clean up the remaining waste. A friend of mine recently bought a set of high end Japanese chisels. 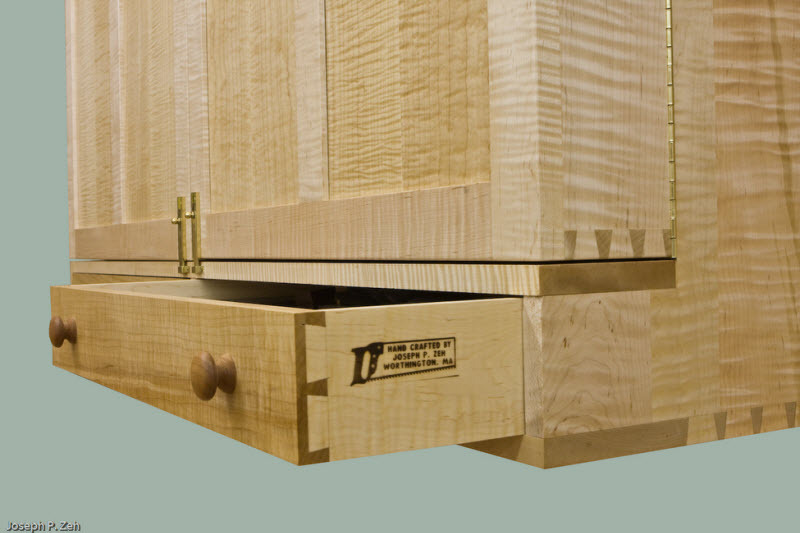 I wanted to try them out on this project and see how they did on tiger maple, a relatively hard, dense wood. I normally use my Lie-Nielsen or Marples chisels, and so I decided to do a comparison of all three. The picture at right shows them side by side with bevel up. While I did sharpen all three before using them I made no attempt to evaluate hardness, brittleness or longevity of the edge. That is an involved and long procedure well beyond the time I allotted for this short evaluation. What I was primarily concerned with was comfort, speed of cut, and crispness of cut. I divided the work evenly among the three and alternated there use frequently. 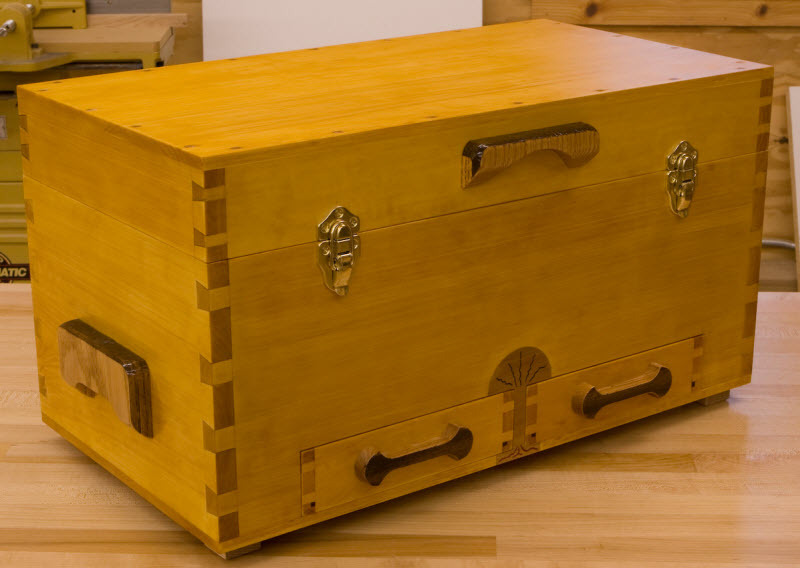 This carcass had plenty of dovetails and pins and I gave them all a good workout. In the end I was most satisfied with the Lie-Nielsen. The Lie-Nielsen was better balanced than either of the other two. The Marples was more top heavy and slightly harder to control. The Japanese chisel, with its triangular shape actually began to feel like it was cutting my fingers as I held it. The apex of the triangle on the bevel side approaches a point and after a while is very uncomfortable. This shape, I believe, is intended to do less harm to the internal corners of the pin socket. But I have never had any trouble with either the Marples or the Lie-Nielsen in that regard. 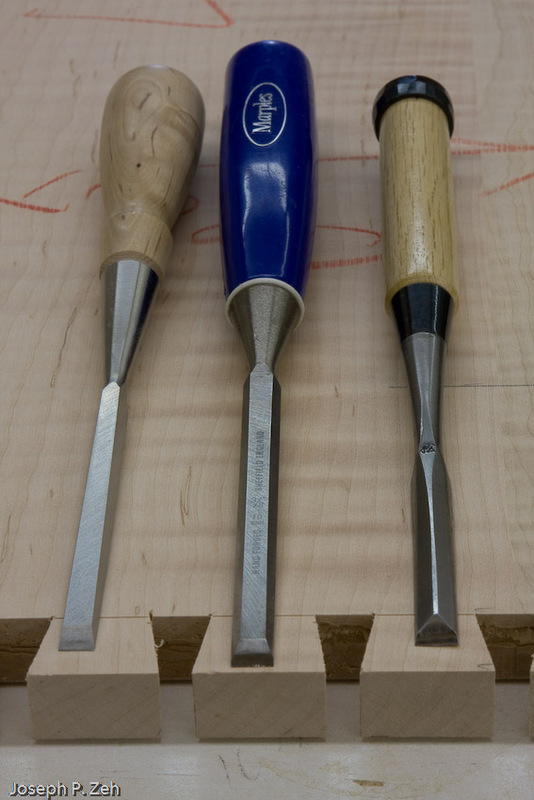 All three chisels cut quickly and cleanly, though I believe I noticed a slightly crisper cut with the Japanese chisel. 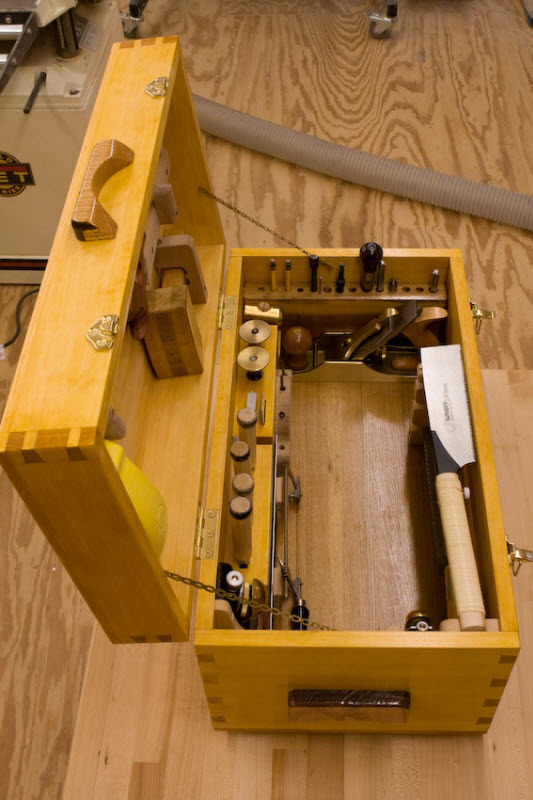 I have read a number of articles that recommend flattening the top of the Marples handle to avoid the mallet blow sliding off, creating, in effect, a glancing blow. I never experienced this problem either. In fact it never occurred once with any of the chisels during this comparison. 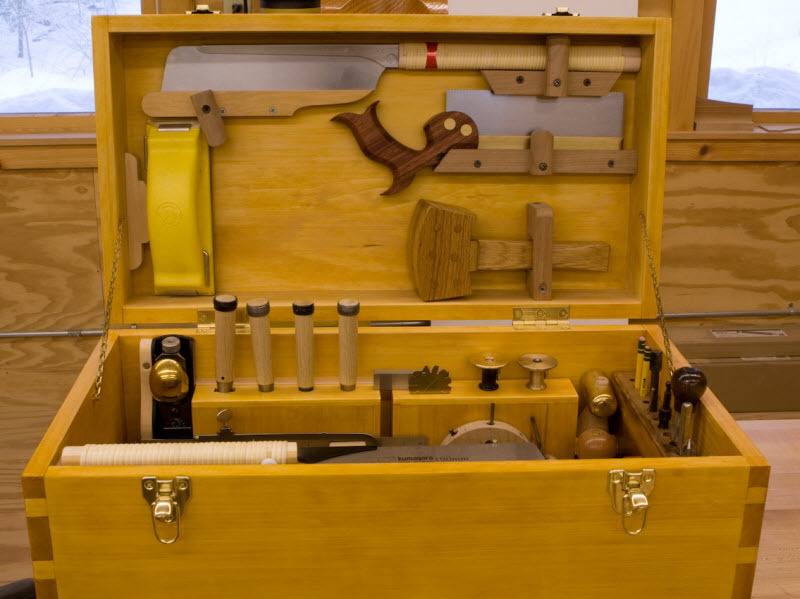 In the end I placed the Marples second and the Japanese chisel third, primarily on the basis of control and comfort. 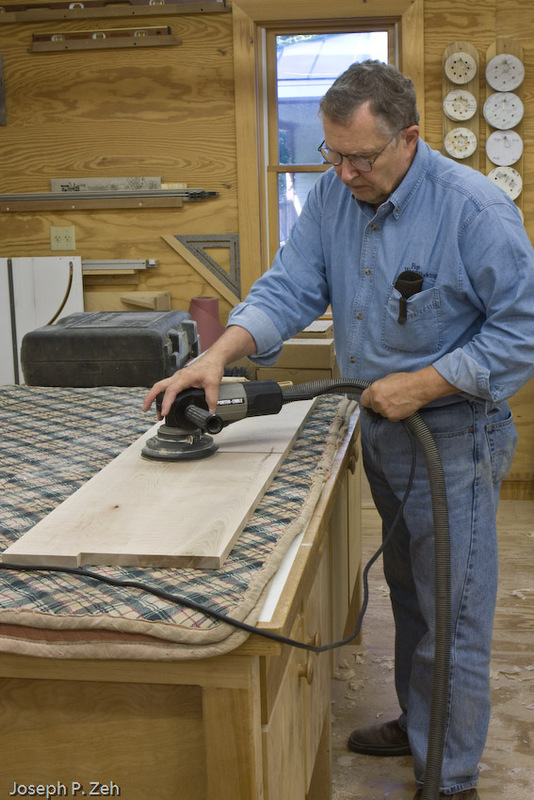 Comfort, I believe, is important, especially if you are chiseling all day long on a set of drawers. There are a couple of other observations worth note. The Japanese chisel used here is in the $80 range (higher for a wider chisel and less for a narrower one). The Lie-Nielsen was about $50 and the Marples much less; I seem to recall they were about $15 for the narrower chisel. Marples now is Irwin and you can buy a set of four for $40, though I believe they are not the same quality as the original Marples. I think I can still justify buying the Lie-Nielsen based on overall comfort and control, even though it is $35 dollars more than the Marples. I can not justify the $80 price tag of the Japanese chisel, even though it is advertised as hand made. Its comfort alone is a killer in my mind. I do have one small gripe about the Lie-Nielsen chisels. The picture at left shows how the Horn Beam handle fits in the socket. I have had several of the handles separate while working, even though I had previously seated them and wo rked with them for some time. I asked Lie-Nielsen for replacement handles, which they graciously gave me, and eventually I got a set that remained seated without the use of a cement or other kludge fix. 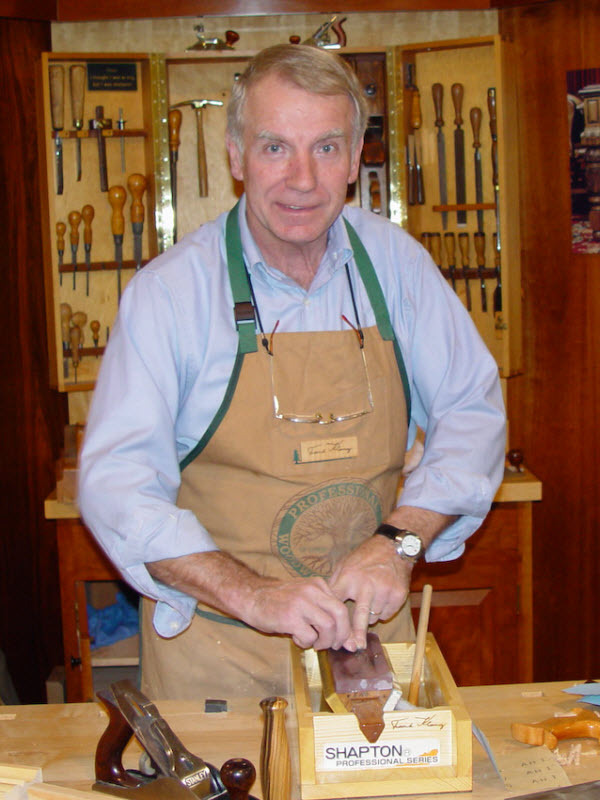 I recommend occasionally oiling the handles with Camilla oil to protect against water during the sharpening process. Once the tails are completed I next transfer them to the pin boards, top and bottom in this case, by using the tails as a mask. However, the top and bottom of this carcass are 52″ long, so I can not transfer the pins in the usual fashion. 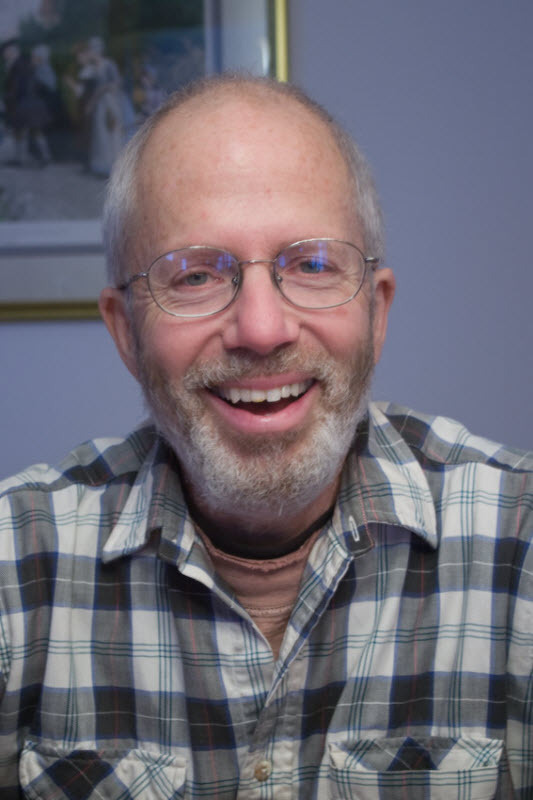 Instead I use a board tacked to my wall at 52″ high that the tail board can rest on, the other end rests on the pin board. 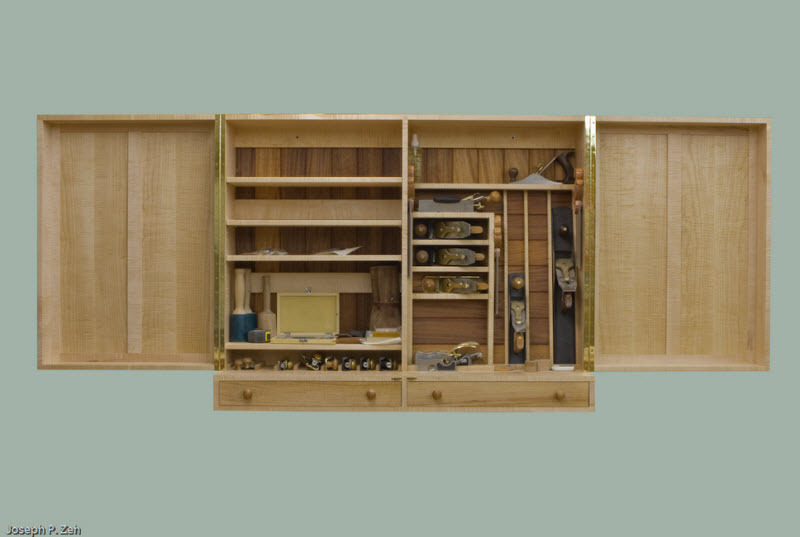 Metal squares and clamps are used to hold everything in place as show in the picture at right. A close up view can be seen at left. Now I can trace the tails onto the pin board with a pencil very accurately. Cutting the pins still presents a problem because the pin board is still 52″ long. Fortunately I have a table that can be raised, and with the aid of some wooden clamps and a stool I am in business. 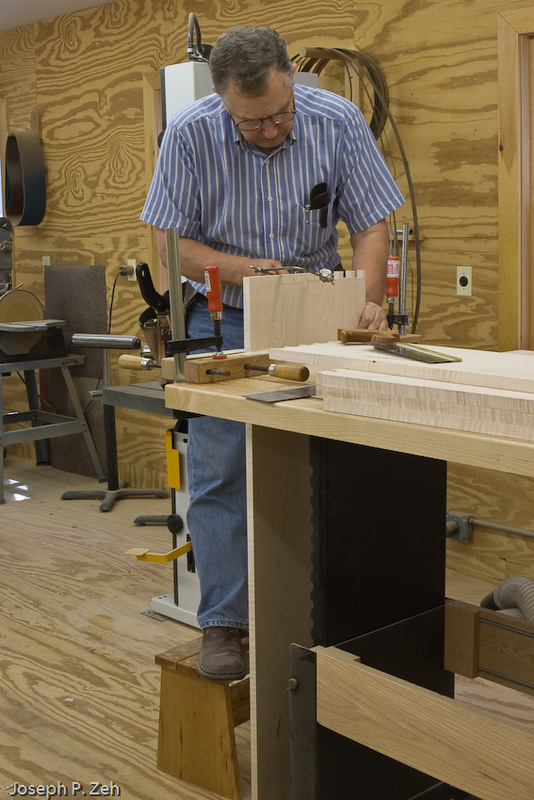 The picture at left shows me cutting the pins with a dovetail saw standing on the stool. You may recognize this stool from a previous post on this site. 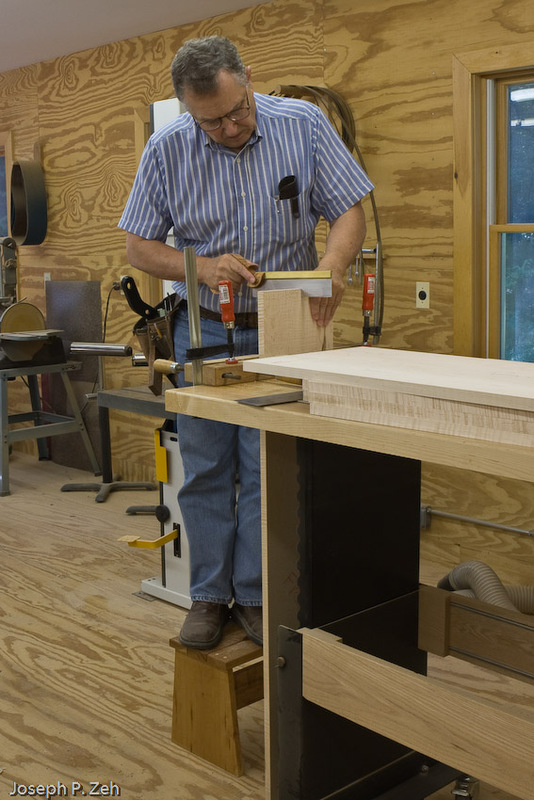 The stool is very stable but you do have to reposition it once or twice as you move across your cuts. 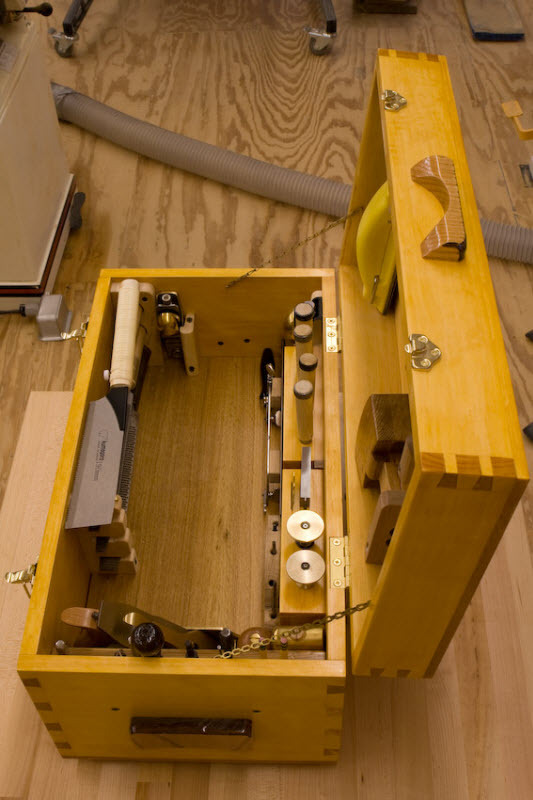 The same setup is used to cut the waste away with the fret saw, shown right. 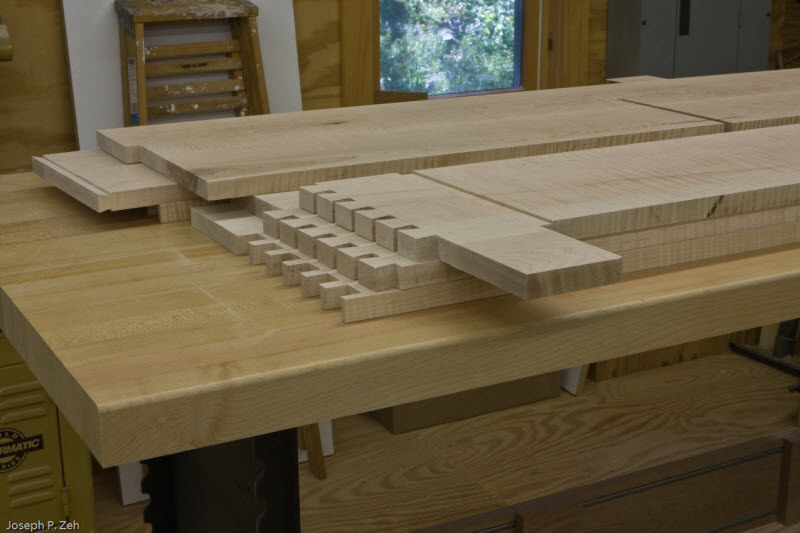 Long carcass panels always present a challenge, especially if it is a dovetailed carcass. 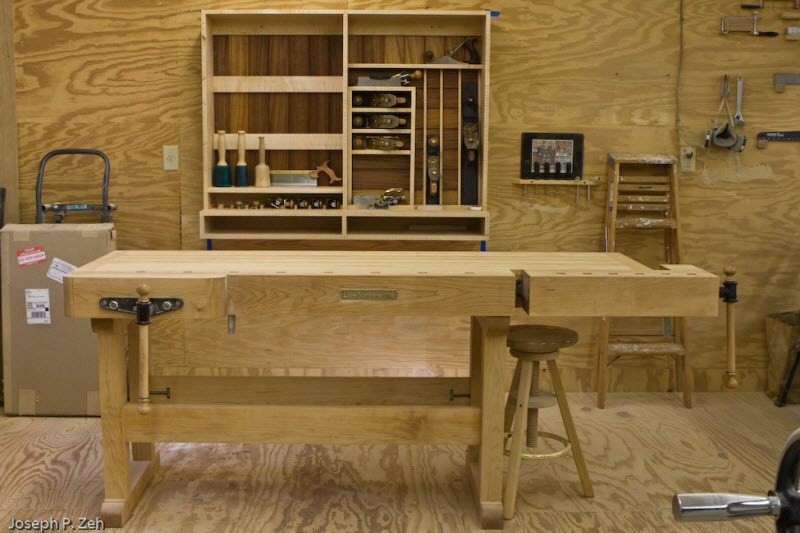 But this adjustable bench combined with a stool or ladder and wooden clamps makes quick work of it. 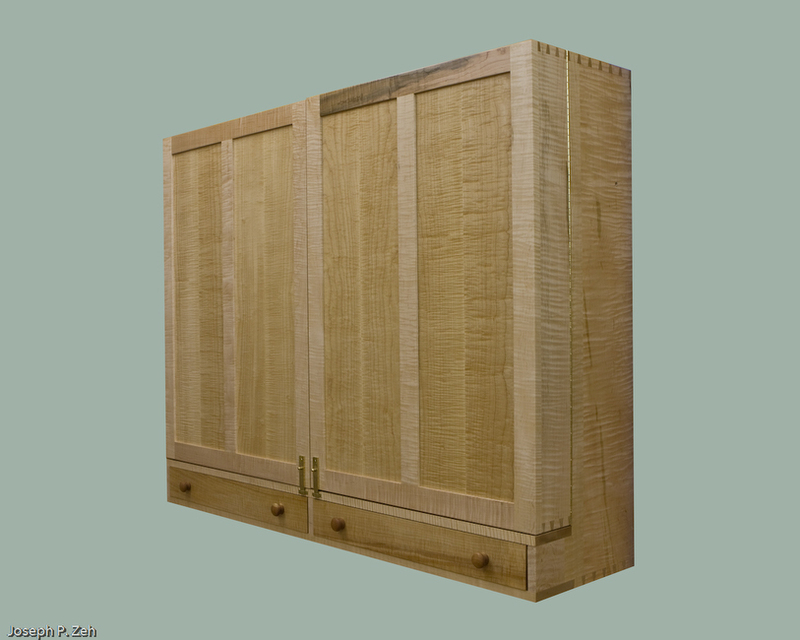 Next I will complete the dadoes, sliding dovetail and notches that complete the joinery. 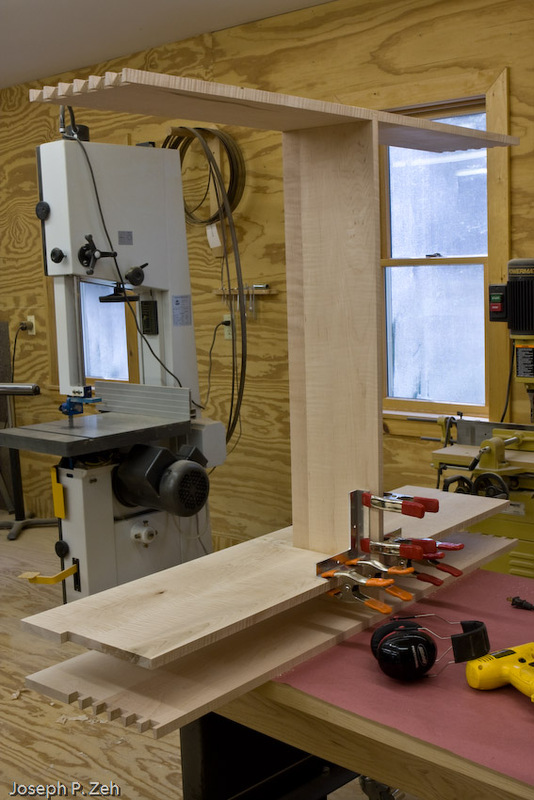 Then I will dry fit everything and develop a glue-up strategy. I will need help with this one, so I will locate a friend to assist. Glue-ups are stressful and need to be completed quickly. Large carcasses like this one add to that stress. So I cultivate a few friends in the glue-up process. It’s an investment that pays off at times like this. You don’t want a novice helping you. That almost always ends up with someone’s feelings being hurt, or worse, the lose of a friend.